This next issue of SECRET SOCIETY OF SUPER VILLAINS signaled a sea change for the series. Departed editor Gerry Conway’s vision of a series that united Jack Kirby’s Fourth World concepts with the mainstream Earth-1 DC heroes as well as fan-popular characters such as Manhunter wasn’t something that incoming editor Jack C Harris was interested in continuing with–he wanted to focus more on the super villains of the title. So this issue, edited by Denny O’Neil, brings about an abrupt change of direction. It must also be said that, as on the fence as I was about Ernie Chua/Chan covers, Vince Colletta was absolutely massacring his work. Colletta’s desecration continued on the interiors, where Rich Buckler had been brought on board to mimic/swipe Jack Kirby’s style. This visual transition from the preceding issues was jarring to me as a kid, and Colletta’s slipshod inks do nothing to help. There are panels in this issue that look as though Vinnie only inked maybe half of what had been penciled in them. I wonder if it wasn’t a rush-job, both due to the abrupt change in direction and the generally unfinished look of some of the art. The story picks up where the previous issue ended, with the Black Racer about to take the life of Darkseid’s minion Mantis. The Racer’s appearance had been teased all through the previous issue, so it’s a hell of an anti-climax when, suddenly, with no preamble, the Secret Society shows up and attacks Darkseid, causing him to wave the Racer away and then call upon Mantis to battle the villains. 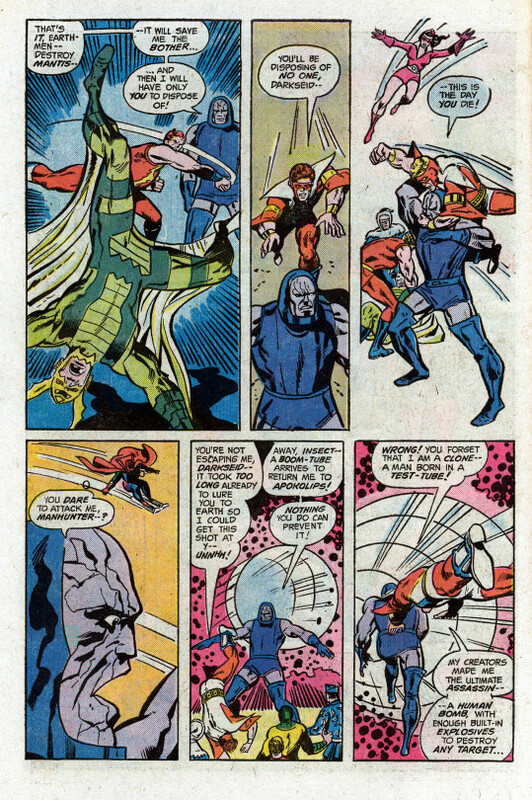 The whole thing is over in seven pages as Manhunter reveals that, as a clone, his creators filled him with enough explosives to make him a human bomb, and he blows both himself and Darkseid up. After last issue, where Darkseid stood unfazed as Mantis unleashed raw Power Ring energy at him, this was a hell of a comedown. But two big pieces were now off the playing field. 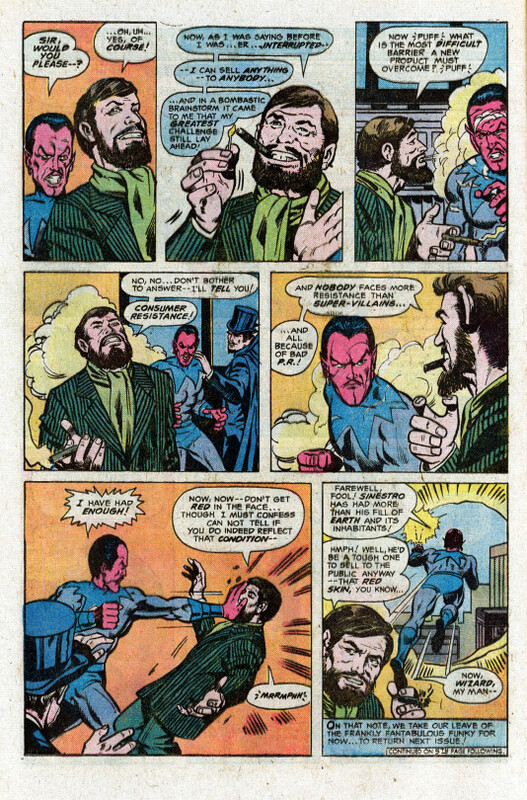 Elsewhere, Funky Flashman is a bit more on-model as he tries to convince Sinestro and the Wizard to let him be their public relations spokesman. Sinestro has no patience for any of this nonsense, and storms out, but the Wizard is intrigued by Funky’s pitch. Meanwhile, across town, Captain Comet pulls himself out of the wreckage where Manhunter exploded, and also retrieves the fallen Green Lantern. 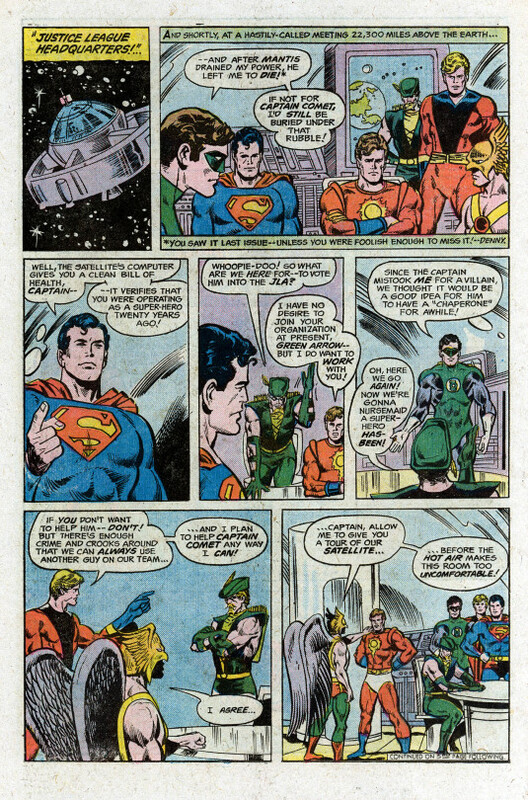 The two heroes quickly work out that thy’re both good guys despite their earlier dust-up, and Green Lantern invites Captain Comet to join him on the Justice League satellite. The League confirms Captain Comet’s history as a hero of old and offers their aid in acclimating him to the modern world. Comet isn’t interested in joining up with the League, but he does intend to hunt down his old partners of the Secret Society, and the League’s resources would be helpful in that regard. As the heroes tour the JLA satellite, a crisis call comes in from San Francisco, where a petulant Sinestro is creating a massive earthquake. 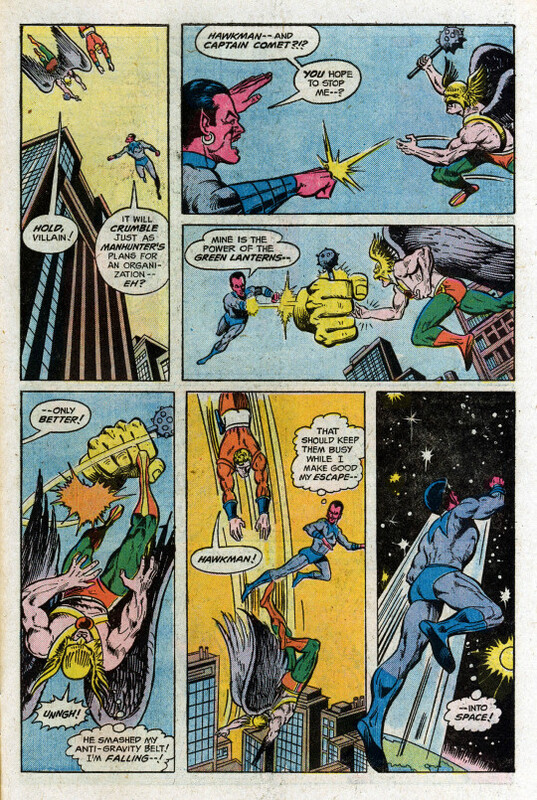 In perhaps the stupidest move on record, Hawkman tells Green lantern that, as GL is on monitor duty, he and Captain Comet will go defeat Lantern’s old foe. I don’t think the Winged Wonder quite understood what monitor duty was for. Hawkman and Captain Comet teleport down from the satellite just in time to hear Sinestro monologue to himself about how he intends to knock the Sinister Citadel to the ground as revenge against the Secret Society before he heads back into space. Hawkman flies to the attack, but is simply and off-handedly dispatched by his foe’s yellow Power Ring. Should’ve let Green lantern come along, Katar! As Sinestro heads into space, the Sinister Citadel begins to topple, and it’s up to Captain Comet to hold it up, which he does. Somehow inexplicably leaving the building standing (”Don’t anybody in there move, or the whole place will go toppling over!”) Captain Comet and the now-flightless Hawkman (his anti-gravity belt damaged in his scuffle with Sinestro) head into space and grapple with the renegade lantern again. 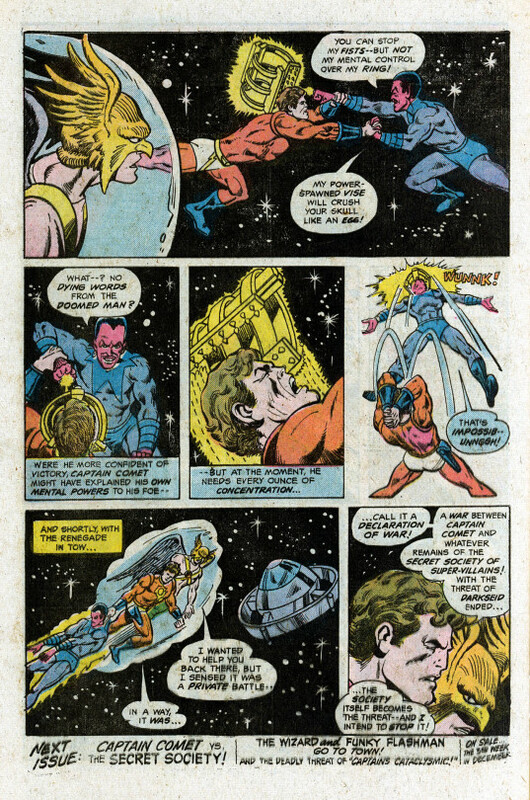 Captain Comet gains the upper hand by using his telepathy to momentarily override Sinestro’s control of his own Power Ring so that Comet can clock him. And so the issue ends, with about as thorough an overturning of the storyline as you can get: Darkseid and the evil Gods of Apokolips are gone, Manhunter is dead, the Sinister Citadel is destroyed and the Secret Society is disbanded. It’s a clean sweep! 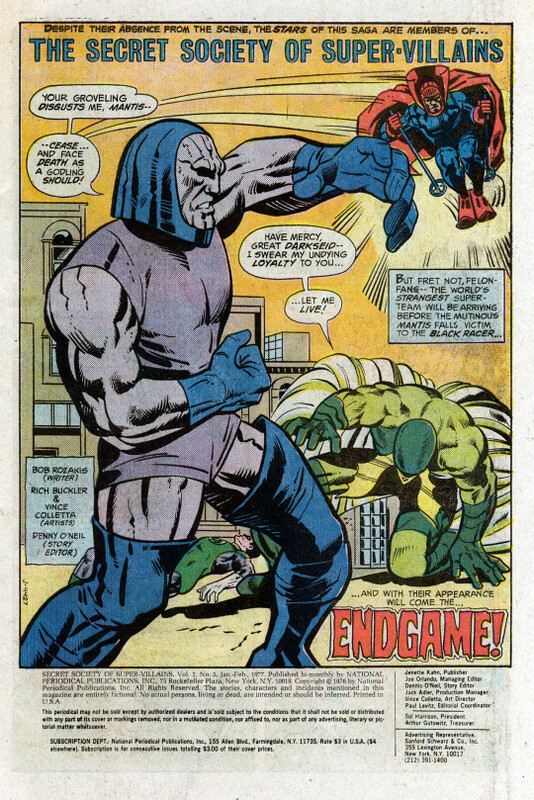 As a kid, I enjoyed this issue, but wasn’t certain about these changes–even then, I felt like the wrap-up of the Darkseid plotline was too immediate and easy.